UFC featherweight champion Max Holloway is headed up to the lightweight division for an interim title fight with Dustin Poirier. While he’s stated that he hopes to return to the featherweight division and defend his belt thereafter, it’s not completely clear how things will actually unfold if he wins interim lightweight gold. Whatever the case, top featherweight contender Alexander Volkanovski wants Max Holloway to know that he still has work to do in the featherweight division. Volkanovski plans to remind the champion of this fact be defeating featherweight legend Jose Aldo at UFC 237 in Brazil this May. 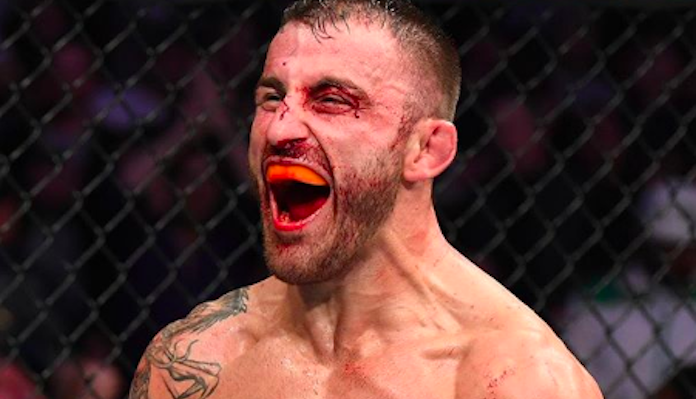 “Come back down after I do this [at UFC 237],” Volkanovski said on the latest episode BJPENN Radio. “Obviously I’ve got a big task ahead of me, but I’m going to get the job done. I’m going to get that win and I’ll make his decision a lot easier for him. Come down, fight me, I’ll take that belt and there’s your decision. Go back up to lightweight you don’t have to worry about that cut anymore you know what I mean? Again, I’m not trying to trash talk, but yeah he’s not done in this division. Of course, Alexander Volkanovski isn’t the only featherweight contender Max Holloway has yet to fight. The featherweight champ also hasn’t met former lightweight champion Frankie Edgar in the cage. In Volkanovski’s opinion, Edgar is likely waiting for a shot at Holloway later this year. Yet the Australian feels that is an unwise strategy for the former lightweight champ. If Max Holloway does end up staying in the lightweight division, perhaps to unify the interim title with the undisputed title owned by Khabib Nurmagomedov, Volkanovski doesn’t plan on waiting around for him. In a perfect world, however, Alexander Volkanovski hopes to add Jose Aldo and Max Holloway’s names to his list of victims in the very near future. 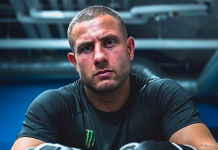 If he does so, he believes he’ll go stand out as one of the greatest featherweights ever. What do you think the future holds for the surging featherweight contender Alexander Volkanovski? Do you think we’ll see him fight Max Holloway this year?